Eassos Photo Recovery is a robust image recovery application that can get back deleted, formatted and lost photos from various storage solutions such as your camera, memory cards, smartphones, corrupted drives, removable drives and so on. 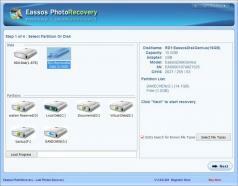 With this tool you can even recover lost photos from RAW drives and partitions. The recovered images can be of various popular formats such as PNG, JPG, RAW, BMP, TIFF, DNG, ICO, MEF, CRW, MAX and others. Eassos Photo Recovery allows you to save the scanning progress so it can be reloaded and resumed after an application restart. It’s also possible to view and preview files even during the scan job and regarding storage drives, the app supports FAT16, FAT32, NTFS and exFAT partitions. The friendly photo recovery wizard will guide you through the process step by step so getting back lost images is as simple as possible.